Of course, we're not the only ones waiting to hear Elgar start playing. All over America, the Class of 2014 will be marching into high school auditoriums and civic centers and Alumni Halls and stadia. Parents will sniffle, the class clown will stand up and bow, mortar boards will be tossed in the air, and the young people will be ushered out of one stage of life and into another. I have graduated three times and I don't remember very much about any of the commencements. I recall it was beastly hot at the Syracuse Civic Center when Liverpool High's Class of '79 passed through. Our salutatorian quoted the Grateful Dead. The commencement speaker for Ithaca College's Class of '83 was Isaac Asimov, and despite the fact I love his writing, I don't remember a single word he said. My parents were stuck way up in the back of the gym, as Athletic Centers were known in the early 80s. My mom told me it smelled faintly of urine and old socks, something I'm sure is not so in Athletic Centers. When I graduated from the University of Maine School of Law in 1990, we sat in the lovely and historic First Parish Unitarian Universalist Church, founded in 1675. Who spoke? Not a clue. (Maybe Brenda Buchanan can fill us in in the back blog.) Graduating from law school doesn't feel like as much of a rite of passage, since you're going to see all your classmates next week in bar review class. How about you, Reds? Any memorable graduations? Your own or others? RHYS BOWEN: I remember my own graduation from London University very well, because there was a lot of pomp and circumstance. 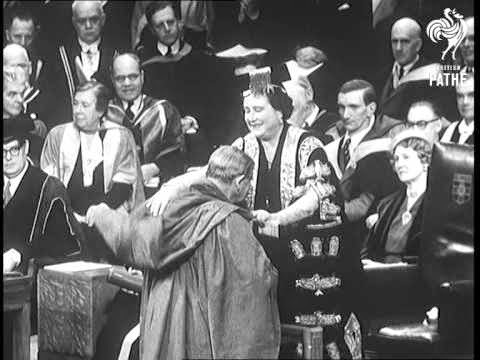 The queen mother was our chancellor and each of us was presented to her as we received our diploma. My parents, were in the congregation but near the center aisle. As the queen mum came down the aisle, graciously nodding to left and right, she recognized my father (who had shown her around the British industries fair several times) and gave him a big smile. My dad never forgot that moment. My son's graduation from UC San Diego was also memorable because President Clinton spoke, so the security was horrendous. We had to be in our seats about 3 hours before he arrived. And he was late. Dominic was due to sing a solo with the gospel choir but they had to cut their performance to one group number. HANK PHILLIPPI RYAN: The QUEEN? The PRESIDENT? Huh. I got nuthin. Except I got sent home from my high school graduation because my white lace mini-skirt was too short. (It was, looking back on it.) It was gonna be under a robe, what was the big difference? I remember thinking--I'm not going back. I thought: What are they going to do, expel me? I did go back, because my parents cared, and I don't remember one BIT of it except for being thrilled that stupid horrible high school was over. In college, we were protesting Kent State. Nobody went. JULIA: They didn't cancel - after the student body protested against the selection of Christine Lagarde, managing director of the International Money Fund, she withdrew. (They objected to the IMF, not to Mme Lagarde.) Instead, we're going to hear former Smith College President Ruth J. Simmons deliver the address tomorrow. She's also the former president of Brown - the first African-American woman to head an Ivy League school. I'm looking forward to her speech! SUSAN ELIA MACNEAL: Julia, congratulations to Smithie! All I remember of my high school graduation is wearing a white dress (it was an all girls Catholic school) and then for college our speaker was Madeleine L'Engle, who I thought was fabulous. And it was an outdoor ceremony on a day that was ridiculously hot. 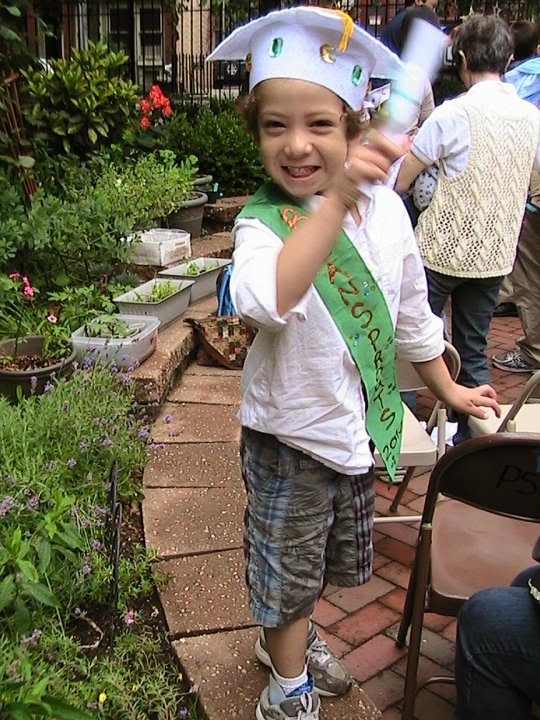 Before I became a parent, I wouldn't have understood — but the kiddo's preschool graduation was incredibly moving. He'd spent three years in the school and we all just loved the other kids and the teachers. But onward and upward! Now sometimes we run into some of the kiddo's former teachers in the neighborhood and he doesn't even remember them — but I do. 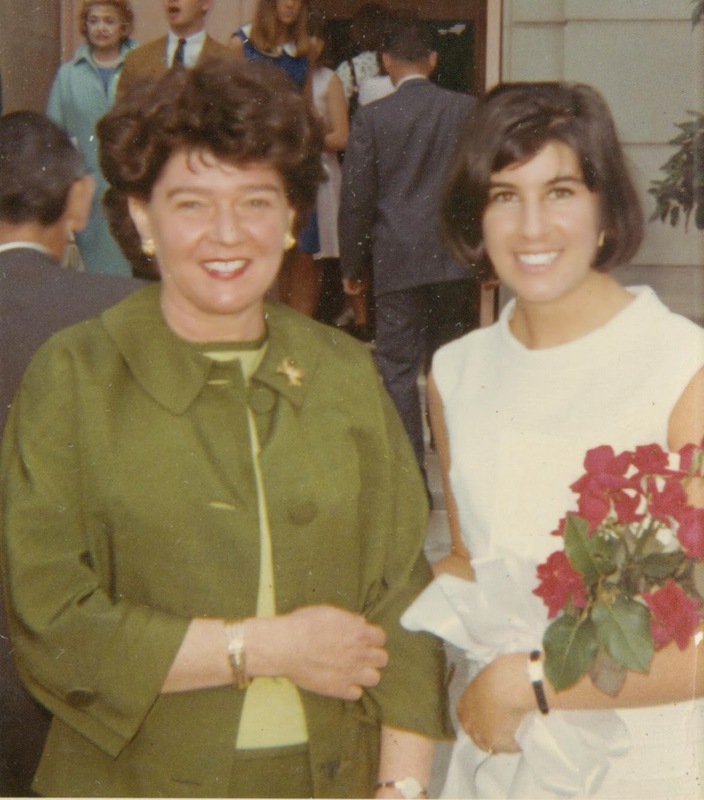 HALLIE EPHRON: We wore white dresses to high school graduation, too, and it wasn't a Catholic school. Madeleine L'Engle -- WOWEE! I'd have been over the moon. 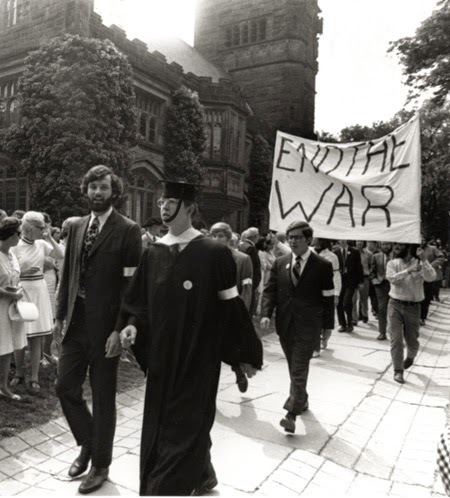 I skipped my own college graduation -- political ferment of the 60s, we were protesting. At my daughter's graduation from Columbia, security was brutal (it was not long after 9/11) and it was teeming rain, so all we could see were umbrella undersides and we couldn't leave until it was over. The queen mum did not attend. DEBORAH CROMBIE: I didn't graduate from high school, having dropped out the beginning of my junior year. I did graduate from college, however, with a BA in Biology from Austin College in Sherman, Texas. (Yay, Roos!) My strongest memory is that it was hot (surprise! ), the ceremony was outside, and I was smothering in my cap and gown. My hair was very short, and I had on big chunky-heeled shoes underneath my robe. My parents were deliriously proud. I have no idea who spoke, but wish it had been Madeleine L'Engle! That, I would have remembered! 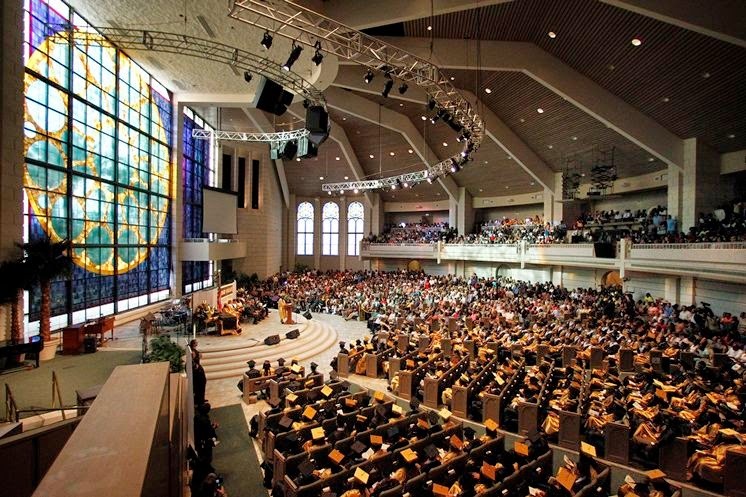 My daughter's high school graduation was so huge (held in the "sanctuary" of a mega-church) that we could barely see her on the stage. When she graduated from college, I was out of town, on book tour. Sigh. Julia, huge congrats to the Smithie! And what's next for her? JULIA: She's home for the summer (and beating the bushes for a job, so if anyone in Southern Maine knows of one...) and then it's off to Boston in the fall, where she'll be pursuing her MLIS at Simmons College. I'm very proud of her. Keep an eye on my Twitter feed Sunday - I'll be posting pictures! (1) There are trans* students at Smith who identify as young men. Graduation memories? We got to graduate twice [eighth grade and high school] in the Ocean Grove Auditorium, a huge place with the most wonderful pipe organ you ever heard. I can’t say I remember much about either college graduation, though. Whenever people ask about graduations, it’s always the ceremony in the auditorium that immediately leaps to my mind. But it’s our oldest daughter’s graduation, complete with flyover, from the Air Force Academy that is the most memorable. After everyone tossed their hats into the air, she came up to where we were sitting in the bleachers and gave me her hat. I was so surprised --- I couldn’t believe she’d found hers in all those tossed caps. And how, you ask, did she get her own hat back? She tied a string on it. Darn smart, those college kids . . . .
What a fun and lovely piece this is! and I love the family pic, Julia - it's a family to be quite proud of. And the speakers - LordAMercy! Very cool. I don't have a thing I can add to that (other than be very jealous about Madeleine L'Engle)! I can somewhat relate to Hank being sent home because her skirt was too short. I did not get sent home from either graduation because my skirt was too short, but I did get sent home from work (Delta Airlines) often for that reason. But, it was hard to correct the problem as skirts were short then and they would not allow women to wear pants to work. Endless stories about my short time at Delta Airlines. Suffice to say, I hated working there. Not a clue as to who spoke at any of my graduations. I went because I am the oldest grandchild on my father's side, and the occasions were important to my beloved grandmother who had attended only a year and a half in the ungraded elementary school class for immigrants (She was self-taught, and very literate, although she never learned to punctuate). But on each occasion, I was on the verge of total collapse from exhaustion. In high school (black robe), there were finals and parties. 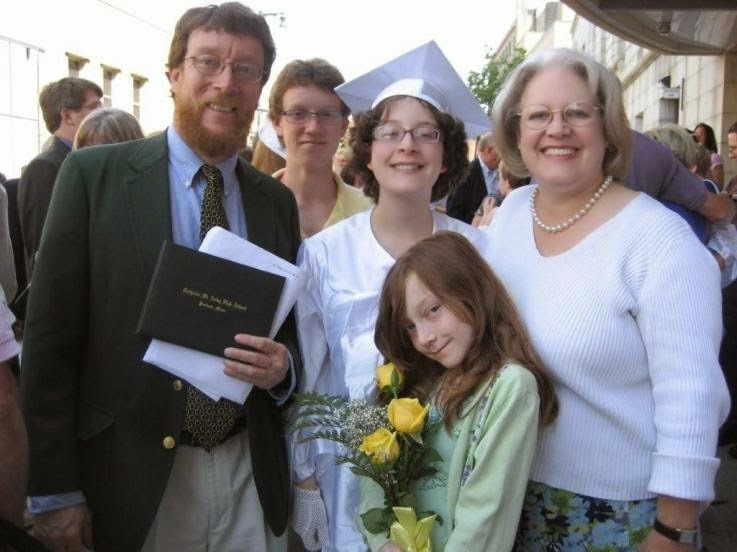 In college (ice blue robe), there had been finals and a night not-quite sleeping on giant plastic hair rollers-- and then my grandmother, who was staying at my apartment, woke up at six a.m. and decided to clean my stove. My last semester of law school, there had been five finals and three papers (I had some incompletes to finish up) in three weeks, and then I had to break up my apartment. I managed it all in a 90+ heatwave (no a/c in those days) on a diet pill a day (I'm hypersensitive and no one told me they were speed). Graduation is total blur except for the brilliant cardinal (for Wisconsin) and purple (for law) hoods that we got to wear, and the fact that I couldn't figure out how to iron the black doctoral robe with the velvet stripes on its sleeves-- not that that mattered after we sat in the stadium for hours in that heat. Five days after that graduation (and still exhausted), in a micro-mini white linen suit, I was admitted to the Bar. I'd accidentally packed and sent home the slip I usually wore with that suit, and the skirt wasn't lined, so I pulled my pale lavender babydoll nightgown down to my waist, tied the straps in a knot at each side, and rolled it until it was short enough not to show, so that no one-- especially my boyfriend's hyper-critical mother (he was being sworn in too) could see through what little of my skirt there was. That was on a Friday the thirteenth. Perhaps we should have considered the date an omen. Said (long ex) boyfriend is currently in federal prison, and I have hated every minute of my legal career. Many congrats to the Smithie, Julia. On June 6, 1968, my class stood in front of Rosary Hall to receive our diplomas. We were all women then, women who had no idea what we would face as the world and the culture transformed. We trained to be teachers and social workers, and many of us married young. The Women’s Movement was a small seed, not yet an embryo, as we tiptoed forward, well educated and confident. People talk about “the 60s” as if the country were filled with hippie communes. Rather, at least on Prospect Hill, rules changed slowly. A student at Albertus Magnus, particularly a resident student, was bound by curfews (and silent study hours and ten p.m. lights out on weeknights). For meals at Dominican Hall, she followed a full-page dress code: skirts, of course, but also detailed descriptions of acceptable types of shoes, sweaters, and blouses. If she wanted to take a walk or a bike ride in slacks, she had to put on a trench coat and leave the dorm by the back door. She could return a book to the library in this outfit, but not study there. She attended tea parties, wearing white gloves; she knew how many cookies a lady takes and how to manage a teacup. In some ways, these were comforting routines. House Mothers kept an eye on sign-out charts and locked the doors at midnight. Male visitors, including fathers and brothers, remained on the first floor of dorms, with few exceptions (moving in and moving out days). I hope that students still take three years of Theology and Philosophy; in those classes the class of 1968 learned the skills we would need to analyze and question assumptions and traditions as the world around us shifted. Off-campus, we “baby boomers” volunteered: tutoring in New Haven; building in Mexico; organizing political campaigns; marching for peace and for civil rights. We were dancing to a whole new musical sound. Yes, the class of 1968 made changes to a few rules concerning curfews and dress codes, but more importantly the student government officers worked with faculty and administration to change the power balance, making Albertus Magnus a more open and cooperative institution. During our senior year, 1967 – 1968, the pace of change increased. A presidential campaign focused on US involvement in Vietnam pushed a seasoned politician and sitting president, Lyndon Johnson, to decide not to run for a second term. In the spring, on April 4, we witnessed the assassination of Martin Luther King, Jr. and the widespread riots that ensued. As our senior year in high school had been shadowed by the death of President Kennedy, four years later, our final year in college was even more steeped in tragedy. Two months later, we graduated. We wore pastel dresses on Class Day, surrounded by our happy families. But, on that day, just after midnight, Robert Kennedy had been shot. He died on June 6, the day we graduated. I made the mistake of clicking on Pomp and Circumstance. Sheesh. It ALWAYS makes me cry. Have fun today, dear Julia! Hurray for you and Ross and the Smithie! Well done..Good..
Julia, I am always touched by the sweetness that emanates from your family photos. You appear a solid, united family with good cheer and peace of being with one another. Congratulations on your Smithie's graduation, and I hope the rain stays away. My high school graduation was memorable because I was the valedictorian and president of my class. The valedictorian was a goal I was happy to achieve for myself, but I was even happier to achieve it for my mother, to whom I think it meant the most. It was a moment of some humor for me, too, as my lovely statue I received was only half the size of the girl who had perfect attendance all the way through school. Her mother worked for the superintendent, and she was responsible for many of us getting the childhood diseases over with early. As president of the class, it was my duty and honor to handle the memorial for four of our classmates that had died that year. I think that was what touched me most. College was such a mass gathering that it really wasn't memorable, other than the fact that I celebrated it with my now husband. For my Masters I didn't go through graduation, and I regret that, as it was a goal achieved later in my life and meant much to me. That same year my daughter graduated from college and my son graduated from high school. 2006 was a very good year. High school and college graduations for my two children were wonderful because they were great moments of pride as a mother. I think the high school ones were a bit more special, as I loved seeing all the kids I known as small children reaching young adulthood and preparing to go meet their futures. I don't remember speakers from any graduations, which bothers me a bit. I wish I'd been more attentive in that area. Denise Ann, one of my friends graduated from Albertus Magnus a year after you did! My college graduation was supposed to be held outside. A horrible spring storm moved it into the gymnasium. It was probably for the best, because we had a better view of the stage from our seats on the gym floor. I remember that the valedictorian was the mom of six kids who returned to school when her youngest was in first grade. She was never in any of my classes but I was really impressed by her story. 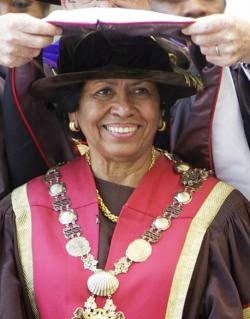 Jackie Robinson received an honorary degree - this was just weeks before he died - as did Ella Grasso, who later became the first female governor of CT. I don't remember who the third honorary degree recipient was. Congratulations! Any graduation is a big accomplishment and a gateway to a next phase so something to celebrate and cherish. Oh Hank, you made me remember my high school days (late 60's, NW Indiana). I think my graduation dress was okay but I spent a lot of time on my knees having my skirts measured from the floor up. Wouldn't be caught dead in a mini-skirt now tho! And only wool pants for football games but not to the sock hop after. No wonder our kids and grandkids think we lived in the dark ages. Had a temp job in FL early 70's - the first day the office manager told me not to wear a pantsuit again because "the gentlemen don't like it." I hope they liked the mini skirt I wore the next day better! Congratulations, graduates! My high school graduation 1966 was a sea of baby boomer mortarboards, over 1000 members of my class. I really only remember the horrible sunburn from rehearsing outdoors in the middle of the day . . . and I remember how proud my parents were. I didn't attend for by U of Minnesota B.S. Ed. degree, but did for my Masters from Lindenwood because that was close enough for family to want to attend. It was a sweet, smaller ceremony . . . and I enjoyed presenting diplomas to my own high school students. Pomp and Circumstance no longer makes me cry because I hear Garrison Keillor's ridiculous lyrics in my mind . . . I'm really late here, but I just wanted to congratulate the Smithie, and her proud parents. Well done, Spencer-Fleming family!